Key lime pie is a classic summer treat and great way to use up surplus lime. Whether you are lucky enough to have lime tree in your backyard or have to buy them from the store, here are some recipes for you. 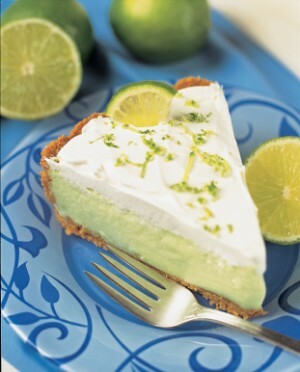 This page contains key lime pie recipes. Easy to make and so yummy. All you need to do is put the Key Lime filling on the graham cracker crust. Top with a generous amount of cool whip. Chill for several hours. See how easy it is and it is so delicious. We made this on vacation one year. It was quick and only takes 3 ingredients. We also do this with Banana cream pie filling. Its so easy and so good. Source: This recipe was from my niece, Jeanne. Preheat oven to 325 degrees F. Mix the condensed milk, egg substitute and lime juice together. Pour the mixture into the pie crust and bake for 15 minutes. Cool on a wire rack and transfer it to the refrigerator for a couple of hours before serving. Garnish with whipped topping. Keep refrigerated. Does anyone have an easy recipe for Key Lime Pie? I would love to find the recipe they use at Tippin's restaurants. The pie was great and the topping was unbelievable! I worked for Tippins for 22 years starting in 1982. The recipe calls for a graham shell - homemade would be best. You can take 1 pkg graham crackers and 1/4 cup sugar and crush them in a ziploc baggie with a rolling pin, soup can, anything that rolls. Add a stick of butter that has been melted and cooled with a tbsp. vanilla a little at a time until you reach a good consistency to form your shell. Always use a small juice glass, measuring cup, etc to form your shell and place another empty pie plate on top of it to keep the form. Bake your shell first before filling but only for 1 - 3 minutes at a very low temperature. Allow the mixture to set but only long enough to run a spatula through it and leave a trail (not a jello consistency). Fold (do not stir) mixture then pour slowly into the shell. Bake for 1-3 minutes but you need to watch it. This only sets the filling. Once the edges bubble it needs to get out of the heat. Store it in a refrigerator of better yet, a freezer to stop the warming process then allow it to sit until it is back to room temperature. The topping is basic homemade whipped cream (I add vanilla) with a lime or lemon garnish on top. I am sorry I cannot be specific about measurements. That would compromise what Price Chopper, Dierbergs, Hen House, etc. are still doing with our formulas. I hope this helps. Let me know what you think.